Fun colourful set with snap together pieces to build four Zoob-bot robots. This inventive set from Zoob includes 54 specially coloured inter-locking pieces, wheels and tyres with a pull-back motor assembly to make the models move. Form joints that rotate and axles that spin, as the motion of moving forward makes the eyes light up. 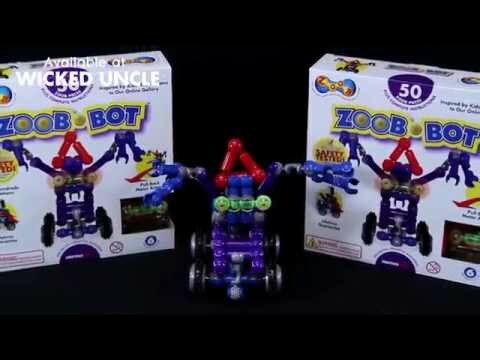 The instructions show how the pieces snap, click and pop together in 20 different ways to build four Zoob-bots. Time to build Cyber Critter, Wedgie Warpspeed, Frantic Fred and Turbo Techno - or use that creative genius to invent your own unique robot.